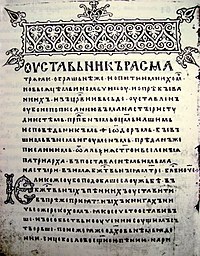 Old Church Slavonic New Testament manuscript. Old Church Slavonic is the language of some Eastern Orthodox churches. It was the first Slavic language for writing literature. It was made by the brothers Saints Cyril and Methodius in the 9th century. ↑ Hammarström, Harald; Forkel, Robert; Haspelmath, Martin, eds. (2017). "Church Slavic". Glottolog 3.0. Jena, Germany: Max Planck Institute for the Science of Human History. This page was last changed on 14 April 2019, at 14:38.